If you are looking for a place where it is all you can eat on Koh Samui, then this place on Chaweng Lake is for you. As of January 2018. The price went from 159 baht to 199 baht. Around Koh Samui you will see places in between 199 baht to 400 baht for “All You Can Eat BBQ”. These places are a great place to find a cheap eat and to try something different. They start to serve around dusk because then all of the flies disappear so they are not buzzing all around the food. It’s great food and great value. Cold beers too!!! This video was taken on Chaweng Lake in Koh Samui. It is a great place to have meal with family or friends. It is very picturesque as the sun settles behind the hills and as Chaweng starts to light up for the night. There are a great choice of different types of meats, seafood, noodles and vegetables. You are given a hotpot and underneath there is a burning piece of coal that heats up the cooking element. You then walk up to the buffet area and get a plate full of the roar ingredients (see above video) and cook them up back at your table and because it is all you can eat, you can go back as many times as you want. The hot plate has a place filled with water, so you can cook things in the water or on top of the hot element. After a while of cooking, the water that you have cooked all the food in, turns into a nice soup (stock). It gets nicer and nicer the more you cook something. The all you can eat buffet is located on Chaweng Lake Road, right near The Ice Bar. 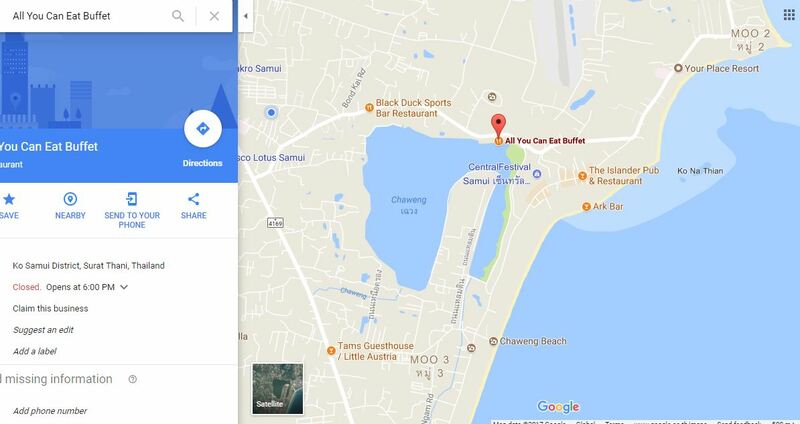 The buffet restaurant sits on the banks of Chaweng Lake and is not far from the main roundabout. It not only is a very cheap way to cook but it is fun to make your own little recipes.